Medicare And Medicaid: How The Campaigns Differ Here's a look at the government health care programs for the elderly and the poor, how President Obama's new national health care law affects them, and how Mitt Romney and Paul Ryan want to change things. Rep. Paul Ryan, R-Wis., discusses Medicare, Medicaid and the federal budget last year, in Kenosha, Wis. Since GOP presidential candidate Mitt Romney picked Rep. Paul Ryan of Wisconsin as his running mate, seems all we've been hearing about is Medicare and its future. No surprise, of course: Ryan is the author of the GOP budget plan that would dramatically remake how the health care insurance program for seniors is managed and funded. He also calls for big changes to Medicaid, the insurance program for the poor, including elderly Americans who have exhausted their means. President Obama's health care overhaul legislation also has significant changes in store for Medicare to secure estimated savings of $716 billion over the next decade. And the legislation calls for a broad expansion of Medicaid. And Romney? He has sort of embraced Ryan's plans, calling their proposals "the same, if not identical." He has, however, distanced himself from a part of Ryan's plan: the part that finds Medicare savings over time equal to those embedded in Obama's health care law — $716 billion. Here's a look at the programs the candidates are selling and their different paths toward reining in the massively expensive and rapidly expanding programs. It's the federal health insurance system for people age 65 or older, certain younger people with disabilities, and people with permanent kidney failure that requires dialysis or a transplant. The system has 47.6 million beneficiaries; in 2009, 9.3 million of those beneficiaries were also eligible for Medicaid. Part A: Hospital insurance that covers inpatient hospital care, as well as skilled nursing facility, hospice and home health care. Part B: Medical insurance that helps cover the cost of health care provider services, outpatient care, durable medical equipment, home health care and some preventive services. Part C: Known as Medicare Advantage, it offers, along with coverage under Part A and Part B, additional health plan options provided by private insurance companies, as well as prescription drug coverage under Part D.
Part D: Coverage that helps pay for prescription drug costs, run by Medicare-approved private insurance companies. 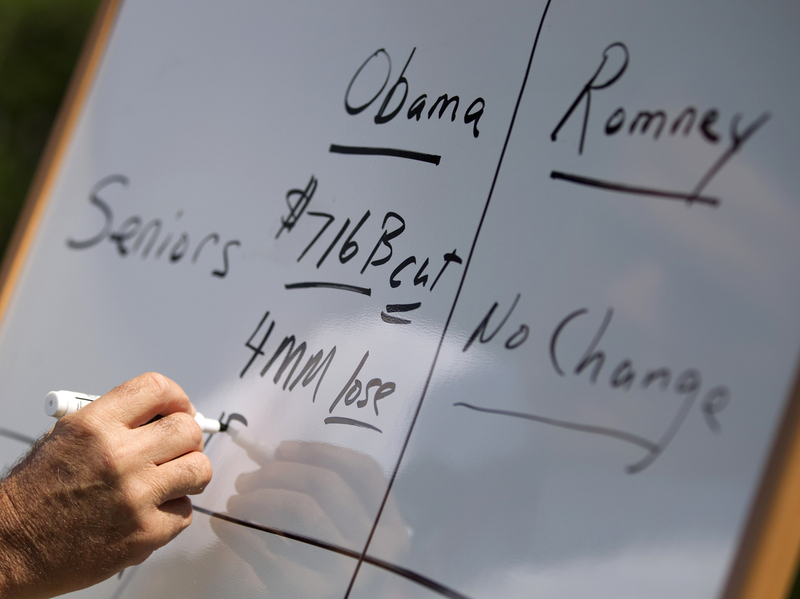 Mitt Romney writes on a whiteboard as he talks about Medicare during a news conference on Aug. 16 in Greer, S.C.
Why do we keep hearing the amount $716 billion? That number has become the focus of debate about whose Medicare plan would do what in terms of saving money and/or cutting services. It comes from the nonpartisan Congressional Budget Office. The CBO has estimated that if Obama's health care law is repealed, as advocated by Ryan and Romney, Medicare spending would increase by $716 billion between 2013 and 2022. What are the differences between what Ryan and Romney have proposed, and what's in Obama's health care law? Obama: The president's health care law preserves the current Medicare system of guaranteed benefits, and closes the prescription drug "doughnut hole" coverage gap that affects some senior citizens. 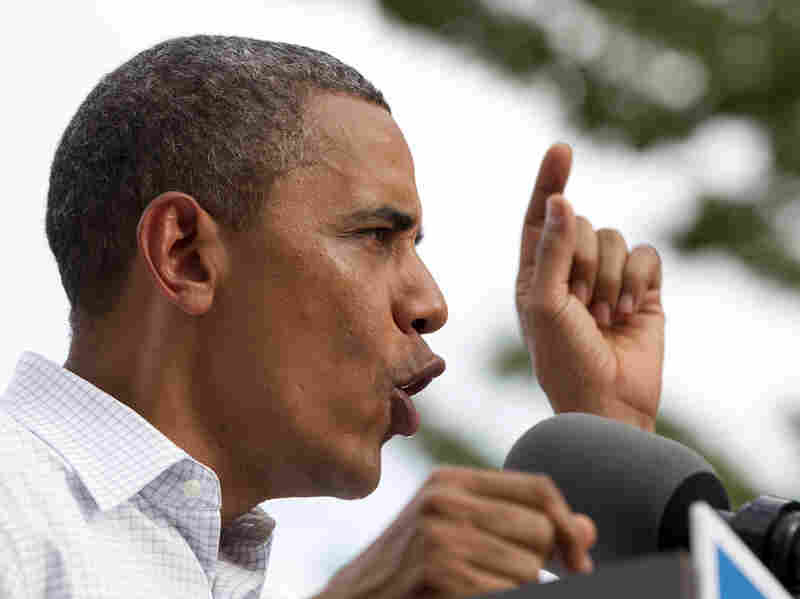 The Obama campaign characterizes the law's $716 billion as savings largely realized by slowing the program's growth with a decade of agreed-to reductions in hospital, private insurance and drug company reimbursement rates; and cutting reimbursements to private Medicare Advantage plans. The private-market Advantage plans were intended to manage or lower the cost of insuring senior citizens through market competition; they ultimately cost more on average than the standard Medicare plan. Obama has asserted that projected savings embedded in the health care law plan would keep Medicare trust fund solvent until 2024; however the legislation uses savings to subsidize health insurance for younger people. Romney: His campaign's most recent statement on the issue read like this, as reported by NBC News: "A Romney-Ryan administration will restore the funding to Medicare, ensure that no changes are made to the program for those 55 or older, and implement the reforms that they have proposed to strengthen it for future generations." 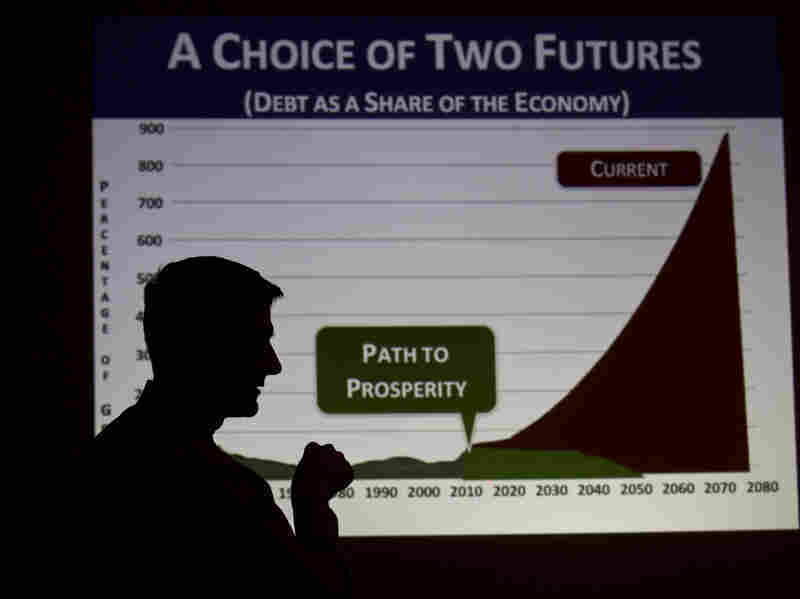 Romney has, in the past, supported Ryan's plan. Ryan: Ryan has proposed a system that would go into effect when people now age 55 and younger hit retirement age. For those future senior citizens, Ryan has proposed to remake the current system that provides a guarantee of benefits. Under his plan, the government would issue credit vouchers to eligible recipients. They would purchase their own insurance, using the vouchers to defray the cost. The CBO has estimated that changes proposed in the Ryan plan could push up out-of-pocket insurance costs for an average senior citizen by $6,400; advocates of the plan argue that market forces will drive down insurance costs. The savings estimated in Ryan's plan would be used for tax relief. President Obama said his health care law bolsters Medicare and Medicaid, but the Supreme Court has ruled that states can opt out of some changes to Medicaid. How does Medicaid work, and how do the candidates compare? The joint federal and state program that cost $389 billion in 2010 helps with medical costs for some people with limited income and resources, people with disabilities, and some families and children. More than 30 percent of the program's spending goes to long-term care, including care for millions of Medicare-eligible senior citizens who have exhausted their resources. The program varies from state to state, but most health care costs are covered if you qualify for both Medicare and Medicaid. Every state operates a Medicaid program for qualified residents, though eligibility rules are different for each state. Most offer coverage for adults with children at some income level. Under Obama's health care overhaul, starting in 2014, most adults under age 65 with individual incomes up to about $15,000 per year will qualify for Medicaid in every state. June's U.S. Supreme Court ruling on the health care law allows states to opt out of this expansion. Obama: Starting in 2014, Obama's health care law would expand eligibility for Medicaid to those below 133 percent of the federal poverty line, which is close to $15,000 for an individual. An estimated 17 million additional Americans by 2019 would be eligible under the expansion. The U.S. Supreme Court, however, has ruled that states can opt out of the expansion requirement without penalty. Romney: Endorses Ryan plan to "block grant" Medicaid, and, according to his website, advocates limits on "federal standards and requirements on both private insurance and Medicaid coverage. Ryan: Would change the way Medicaid is paid for by converting the matching federal payments program to fixed-dollar block grants made directly to states, which can use discretion in spending the money. The CBO has projected a large reduction in payments, resulting in fewer people eligible for the program.